Today is my second day home from vacation and I’m running around while trying to get to the giant pile of laundry on top of my washing machine. 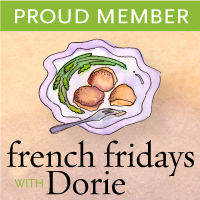 Today is also the cook’s recipe choice for French Fridays with Dorie and Cook & Share Food Revolution Day. I think Dorie’s spicy Vietnamese chicken noodle soup is just the kind of light but flavorful meal you want to enjoy at home after vacation. It’s a recipe I’ve wanted to make since joining FFWD and a perfect bowl of wholesome spicy deliciousness that can be shared to celebrate Food Revolution Day. My garden was quietly producing stalks of fresh Thai basil, mint and cilantro without any idea that a food revolution was brewing on it’s horizon. 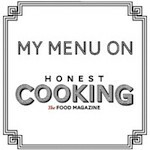 As it turned out my herbs would be willing participants in an international movement for awareness of the importance of good wholesome food and essential cooking skills in our communities started by Jaime Oliver who has a passion for teaching cooking from scratch. Yes, I pressed my fresh herbs into service for a global cooking day to try and raise awareness for the importance of making meals from scratch using fresh ingredients in our own kitchens, including using herbs from our own kitchen garden plots, just like our parents and grandparents. I also loaded up my spicy Vietnamese chicken soup with loads of fresh bean sprouts, what can I say(? )- besides I love bean sprouts, graduated from high school in 1972 and can remember the Beatles song “talk about a revolution, when you talk about destruction/ don’t you know that you can count me out”…just like it was yesterday. I also made a red chili oil to swirl on top of my soup using roasted chili paste mixed into toasted sesame oil. The red chili oil, bean sprouts, chopped raw cashews and fresh herbs are garnishes on top of this soup that should not be missed- just think of your mouth experiencing it’s own taste bud revolution in honor of this important Food Revolution Day. Put cilantro stems, star anise, lemongrass, ginger, dried chiles, garlic coriander seeds, and peppercorns in a square of cheesecloth and tie bundle together. Add to a stock pot or dutch oven. Add onion, then pour in chicken stock and coconut milk. Season with 2 tablespoons of fish sauce, brown sugar, and a generous pinch of salt and bring to boil. Lower to a simmer, slide in the chicken breast, cover the pot and poach the chicken gently for 15-20 minutes or until cooked. Transfer chicken to bowl to cool, turn off heat to soup and keep covered. Cook the noodles according to the package. Once the chicken is cool, shred it with your fingers (a fork can help with this). Bring the soup to a boil again, then lower to a simmer and stir in chicken and noodles. Add more fish sauce, lime juice and salt to taste. Serve in bowls with fresh herbs, bean sprouts, chili oil and cashews. Just saw this on facebook and had to come read right away. I love all kinds of Vietnamese noodles and so happy to see this! I can even eat it right now (for breakfast). YUM!!! This soup looks so tasty, Patty! I love the aromatic flavors – I’m so envious of your Thai basil plant! I want to try this deliciousness soon! It’s going in my folder. Talkin’ about a revolution! This is one of my favorite recipes from the book. So happy you enjoyed it. I’m ready to make it again!! This is such a knock out soup great choice… I’ve pinned this recipe to make for my family. I missed this one too… Happy REvolution! This soup is gorgeous! On this chilly, spring, Friday afternoon – this is just what’s needed. Way to put your herbs to work! This soup really is a revolution for the taste buds! So nice that you can use herbs from your garden in it, too. My herb garden is really taking off now, too. Your presentation of this soup is perfect. I might have to make some soon! A revolution indeed! This is a bright way to ease back into home life after being away! Hope you have a wonderful weekend, Patty! I don’t know how you find time to make such an amazing looking soup. I know when I get back from anywhere it takes me days to catch up. Good thing I don’t go anywhere often! I wish i was closer, I pop in for a bowl for dinner. Hope to see you soon, enjoy your weekend. You and Liz had the same recipe idea. And it makes me want to be the kind of person who makes asian soups, and I´m not…! But I have to try this one, it looks so fresh and interesting. Have a good weekend Patty! I need to make this one up, too. I even have the fish sauce. Your photos always amaze me! Happy Food Revolution Day! And what a wonderful way to celebrate! I love that you had so many of these herbs growing in your garden. Even more special. Thank you for sharing, sweet friend! wow Patty, let’s lunch together! This looks so delightful and tasty. A great “real food” version of a soup that many think is too complicated to make at home to celebrate FRD2013 – thanks for participating! How wonderful that so much of the soup’s soul was already growing in your backyard, Patty. When I first made this one, there were a lot of things I omitted but now I want to make it again with all your additions. Your soup looks beautiful. I love all the flavors in it especially the coconut milk. Dorie has so many wonderful recipes in this book. I started doing this group years ago and never could get my act together every Friday. I wish I had because each dish looks more delicious than the next. Great photo! Such a gorgeous looking soup! I haven’t made this soup yet but I know my husband will go ga ga over this. I’m happy that I wasn’t the only blogger mentioning Food Revolution Day. Nice! And this soup looks great. My husband would *love* something like this so I’m definitely saving this for later! Patty – this is one of my all time FAVORITE soups!!! I love how you can simply walk outside and pick from your glorious garden. Love, love your cover photo – simply stunning. Hope you are having a restful Saturday despite doing laundry. Smile. All kinds of revolutionary goodness in this bowl! I’m salivating at the thought of all those crunchy bean sprouts and cashews… I totally missed the official Food Revolution day but, like you, I’ve been a part of it for a long time Happy weekend to you! What an irresistible combination of flavors for a marvelous welcome home dinner! I wish I could grow basil but the snails love it more than I do! What a wonderful soup to eat anytime! I love that you have so many herbs growing in your garden. I really need to get on that ASAP. Beautiful pics Patty! Lovely light and appetizing soup! Have made variations of the same for ages and have to check how my recipes compare with this tasty version! Am a great fan of JO: remember him cheekily cooking on TV decades ago – who was to know how much he would achieve around the world in helping out-of-work youth, drawing our attention to responsible, sustainable eating, encouraging self sufficiency and teaching both old and young healthier but still fun ways to eat! He will be remembered for much more than his cooking!! I made a list of all the dishes others did this week that I loved the first time around so I could make them again soon and this one is #1. Loved it and it looks so beautiful here. Stunning photography and simply beautiful writing. You more than did Food Revolution Day justice And I would very much like some of that soup too !! I definitely will be trying this one out. Though I can’t say I have the fresh herbs from my own garden (too much traveling for that one) but I will get some organic from our local farmers market. I am just so impressed that you grew your own – way to go !!! Your soup looks terrific. I’d love that upon coming home from holidays too! Welcome home. These look great. I love a big bowl of hot and spicy soup! Wow – gorgeous. This is one of two recipes that I still have to go back and wait. I guess I didn’t realize what I was missing out on. This is an absolutely beautiful soup! I want to take a sip! Seriously. Wish I could taste test this right now. LOL! What a great looking soup! I absolutely love fresh-tasting soups like this, and all of the bright flavors and herbs you added sound amazing, Patty. Thanks for sharing and brightening up my Monday! Oh Patty, I love everything about this vibrant, delicious, gorgeous soup! This soup looks so delicious, and it sounds especially good since I have a cold and a cough! I would love to have a bowl of this (with extra chili oil please) right now! What great flavors for a chicken noodle soup! Hope you get caught up soon, coming back from a trip is always so much work! I love how we both picked the same dish! Loved this…and yours is just gorgeous, Patty. I want to make this soup exactly the way you did–I know I’d love it. The chili oil is a nice touch and I love the extra crunch that bean sprouts provide. I LOVE your addition of chili oil! We made this for our British family who thought it was amazing and we always make a HUGE vat of this since we just sit and endlessly eat it!